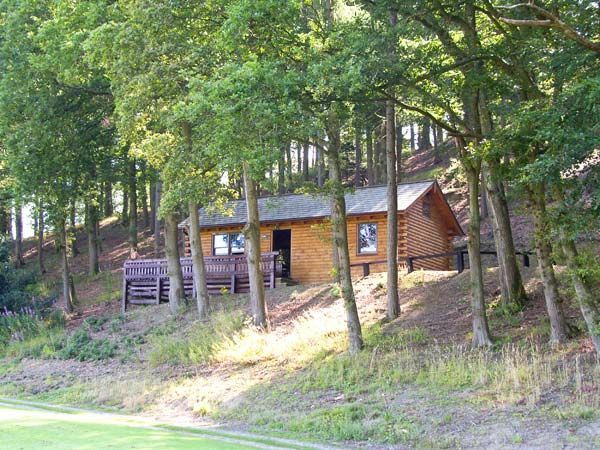 Hollies Lodge is a luxurious log cabin nestled in the woods on the edge of Lakeside Golf Course. With a private balcony and fabulous hot tub that looks out over the tranquil water of the fishing pool and the Montgomery Canal, and an impressive four poster bed in the bedroom, the lodge is an idyllic place for a romantic retreat. Close to the amenities on offer at the golf club, as well as providing two for one rates on the course itself, Hollies Lodge is a wonderful base from which to enjoy the peaceful, entertainment and lovely views of this pretty region. All on the ground floor the lodge has one four-poster double bedroom and a shower room with a shower, basin and WC. The open plan living area has a kitchen, breakfast bar and sitting area, complete with electric fire; perfect for cosy evenings in, when the weather is less than ideal. The lodge boasts a decked balcony with hot tub, and access to 30 acres of woodland, perfect for whiling away long summer days basking in the peaceful beauty of this lovely place. General amenities include: electric central heating with an electric fire, an electric oven and hob, a microwave and fridge. There is a TV with Freeview, a DVD player, and a great selection of books, so guests won’t be short on entertainment, no matter what the weather does. Fuel, power, bed linen and towels are all included in the rent and a cot and highchair are available on request. Ample off road parking. Sorry, no pets and no smoking. The nearest shop is two miles away, and the nearest pub is just one mile. There is also an on-site bar and restaurant a mere ten minute walk away. Please note: there are four steps up to the front door, so care must be taken and the lodge may not be suitable for less able guests. The hot tub is available from 4pm on your arrival day. Nearby Garthmyl is a pretty village, close to Newtown and Welshpool and the bustling shops and nightlife they offer. The surrounding area is lush and green, with an abundance of walking and cycling trails, fishing to enjoy and wildlife to discover. For visitors looking for a bit of an adrenaline rush there are also clay pigeon shooting and quad biking opportunities. Take in the lovely scenery of a ride on the Welshpool & Llanfair Light Railway, discover the local history with a visit to the ruins of the ancient Motte and Bailey castles in Montgomery, an impressive county town, or admire the views from one of the many of picturesque walking trails along Offa’s Dyke. Slightly further afield are the famous towns of Shrewsbury and Ludlow, which are rich in history and things to see, such as the impressive medieval castle at Ludlow. After a busy day spent discovering the plentiful, vibrant sights and history of this stunning rural region, head back to your luxurious lodge; a wonderful, peaceful haven and a perfect base from which to explore the beautiful Shropshire countryside.